Nearly 700 Japanese, aliens and American-born alike, prepared themselves to leave by bus and train this afternoon for the Wartime Civil Control Administrations assembly center at Santa Anita race track as the first evacuation order became effective. 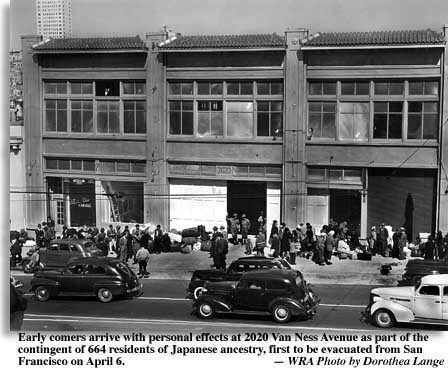 Under arrangements already made with a responsible member of each family to be evacuated the evacuees were to assemble at the WCCA control station, 1701 Van Ness-av, or at the annex, 2020 Van Ness-av, and from there will be taken to a railroad station by bus. They were to leave in two groups, the first at 4:30 p.m. and the second at 5 oclock. The area to be vacated comprises the northern and western waterfront districts of San Francisco. Evacuees were instructed to bring with them sufficient blankets, bed linen and towels; toilet articles, soap, comb and mirror; adequate clothing; knives, forks, spoons, plates, bowls, cups; other small incidental property which can be carried easily. Upon arrival at Santa Anita, evacuees will be housed, fed, and assigned to do community maintenance work which will help to bring about a well organized, unified assembly center. When facilities are ready at Manzanar, in the Owens River Valley, the Japanese will be taken there. Eventually, the Army believes, a good portion of the Japanese will be taken beyond the Rocky Mountains, far from the Western defense zone. San Francisco Japanese who will move later were urged by Colonel Karl Bendetsen, General John L. DeWitts chief of staff for civil affairs, to avail themselves of the special assistance offered by the Federal Reserve Bank and 60 WCCA offices on the Pacific Coast. Furniture and other bulky possessions of the evacuees will be stored for them by the Government for the duration of the war. Colonel Bendetsen also asked co-operation of West Coast draymen in solving the problem of removing and storing the propery of the Japanese. Photo, and caption information, from the War Relocation Authority.